It’s Prequel Appreciation Day! Created by the Star Wars Prequel Appreciation Society (SWPAC), the annual day of celebration takes place this year on May 20th. The prequels have always been close to my heart – in 2006 my husband proposed to me at Villa Balbianello, the Episode II filming location in Italy where Anakin and Padme’ share their first kiss, and are later married – the most romantic place in the world for this prequel fan. 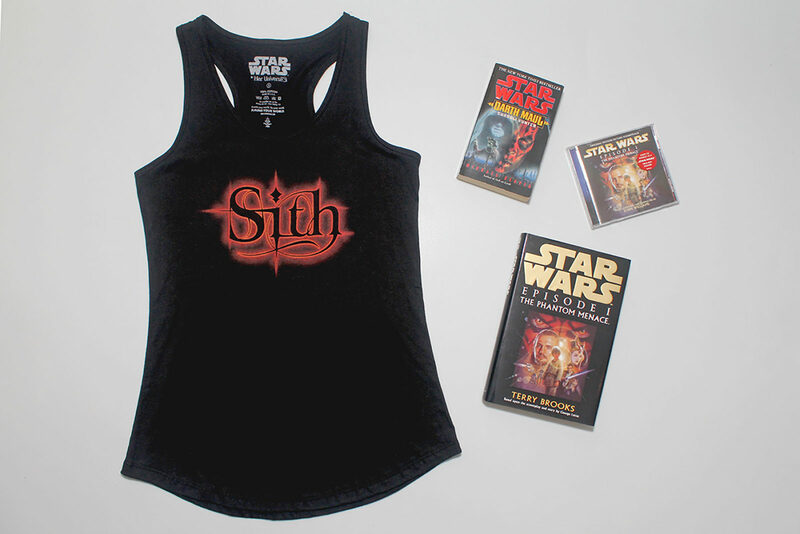 For Prequel Appreciation Day, SWPAC encourages fans to share their 10 favourite things about the prequels – seeing as this is a Star Wars fashion blog, I thought I would share my top 10 prequel-themed fashion items from my wardrobe. Well, it ended up being more than 10, but sometimes it’s just too hard to choose only 10! For me, the combination of red and gold are always a great choice for Padme’ themed apparel – her ‘Theed throne room’ gown from Episode I is one of her most well known outfits, and one of my favourite costumes from the entire Star Wars saga. I love these two red/gold t-shirts from Her Universe – the first features artwork by Tsuneo Sanda, with Padme’ Amidala in her ‘picnic’ gown from Episode II, Anakin Skywalker from Episode III, and even Shmi Skywalker too! 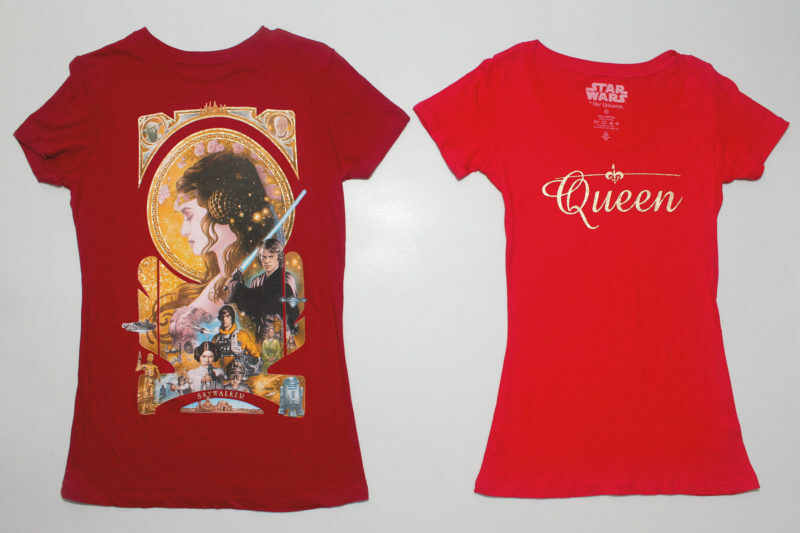 The second t-shirt is a gorgeous red with the gold text ‘Queen’, with the Naboo symbol. The Cartoon Network micro series ‘Clone Wars’ filled the anxious wait between Episode II and III, but it tends to be a little forgotten these days. I absolutely love the series – especially the episode of Padme’ Amidala on Ilum. Her ‘Snowbunny’ outfit is one of my favourite costumes that I have made, and so I was very excited when print-on-demand company Zazzle featured her outfit in their range of images available for t-shirt printing (I also picked up two prints, to add to my collection). 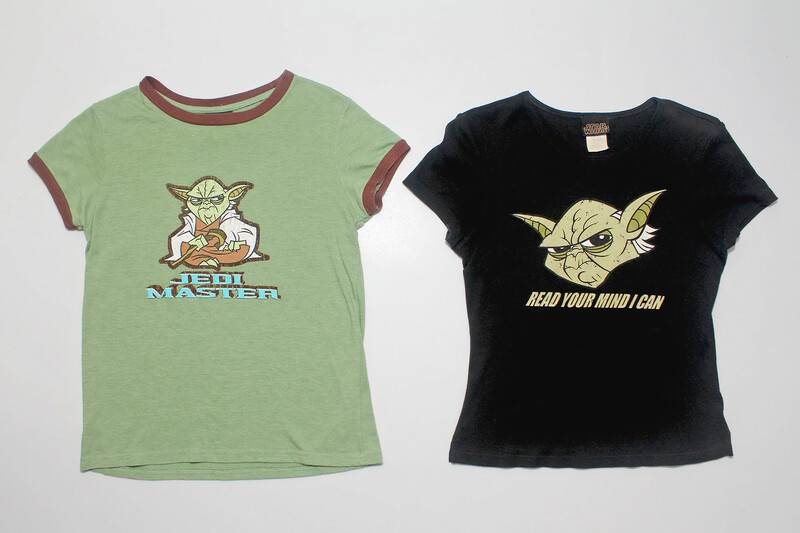 Yoda features in the Ilum episode too, and as a fan of all things Jedi, I had to grab these two women’s t-shirts featuring the famous Jedi Master, as seen in the ‘Clone Wars’ micro series. I picked up the green t-shirt second hand from a friend, while the black t-shirt I bought from the (sadly long gone) Star Wars Shop – the print is actually fuzzy to the touch, I love it! 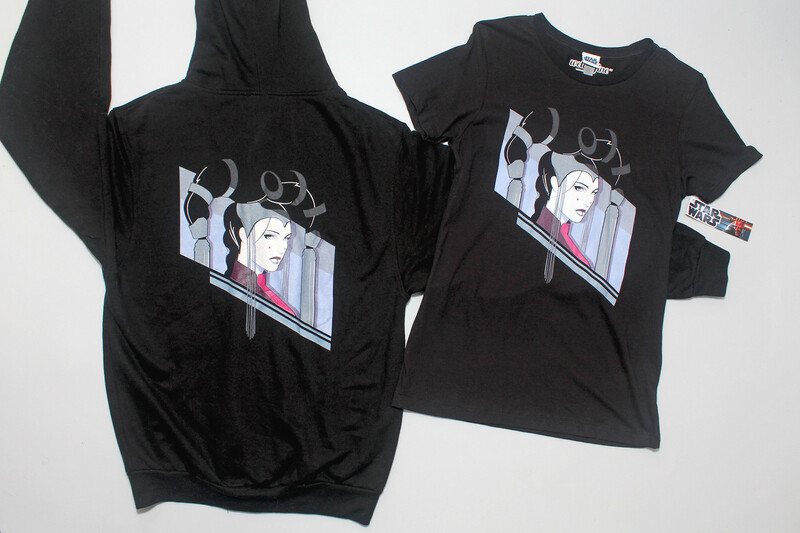 To celebrate the release of Episode I in 3D in 2012, We Love Fine released a range of apparel featuring this gorgeous Queen Amidala artwork by Craig Drake. I love this artwork style, so I picked up both the women’s t-shirt, and the unisex hoodie. The hoodie is one of my most worn items in my wardrobe, it’s so comfy! I picked up this Darth Maul themed tank top during a Her Universe sale – it’s great to have a Sith themed garment that doesn’t feature Darth Vader! I have such fond memories of watching Episode I over and over with my daughter when she was young, so I’m always keen to add more women’s Episode I apparel to my wardrobe (and Darth Maul is awesome). As a huge Queen Amidala fan, I love the Naboo symbol – but Her Universe is the only licensed company to use the symbol for jewelry items (so far). 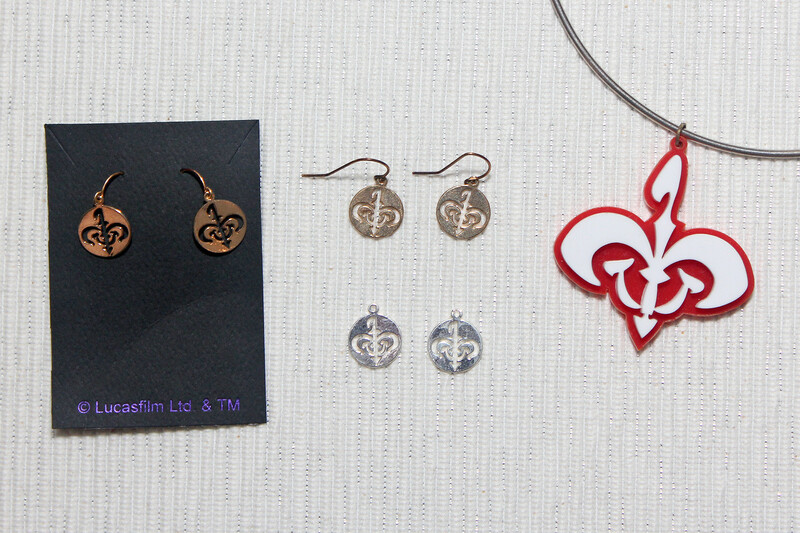 I love the Her Universe Naboo symbol earrings and charm so much, I bought two of each! I also commissioned this acrylic Naboo symbol pendant from an Etsy seller many years ago, and have unfortunately lost track of who made it – I would love to see a jewelry company make a pendant like this! My first Valentine’s Day with my husband (when we were dating), he gave me this wooden japor snippet he carved himself. It is so special to me – I wore it against my heart inside my wedding gown. 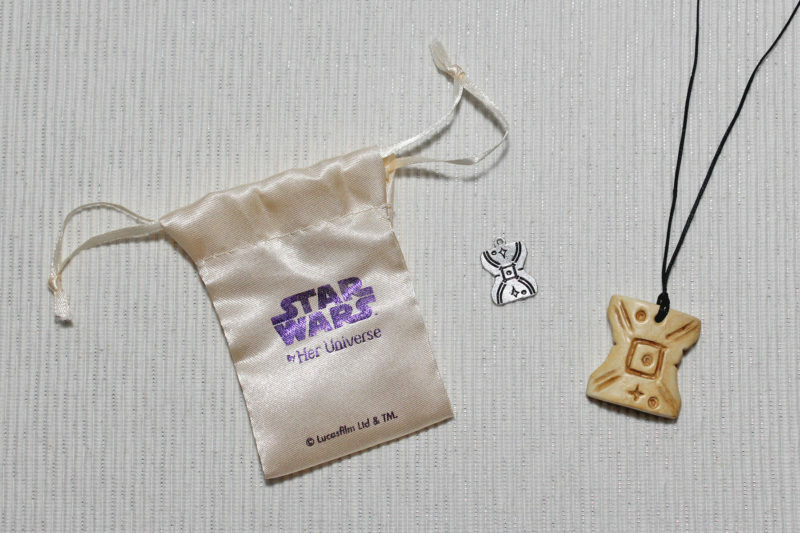 Like the Naboo symbol, Her Universe is the only licensed company to use the japor snippet design as a jewelry item, with their limited edition charm. I wish I had been able to buy more of this charm, to also wear as a necklace and earrings. While these next items reside in my Queen Amidala collection, rather than my wardrobe, they are wearable, so I wanted to include them. The first is a Pizza Hut employee apron from 1999, made by Barco. 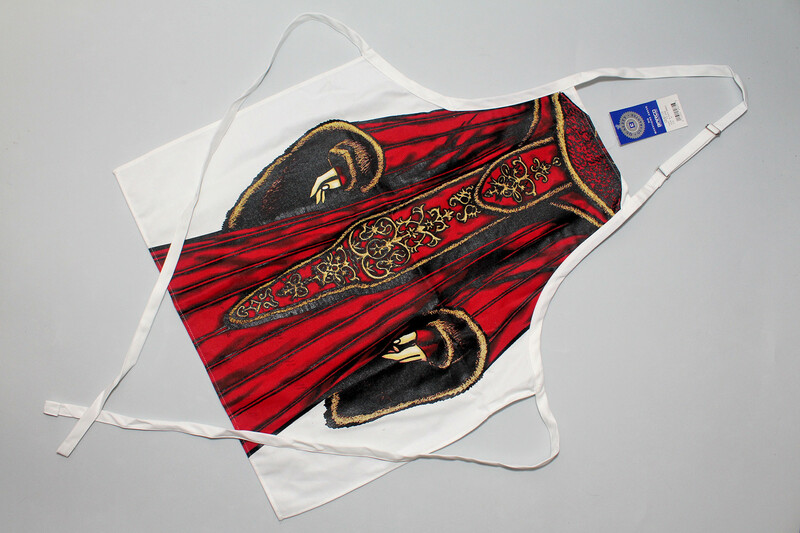 The front features Queen Amidala’s throne room gown in a large all-over print – as much as I would love to, I’ve never used this apron, as it’s still like new (complete with it’s original packaging and tags). 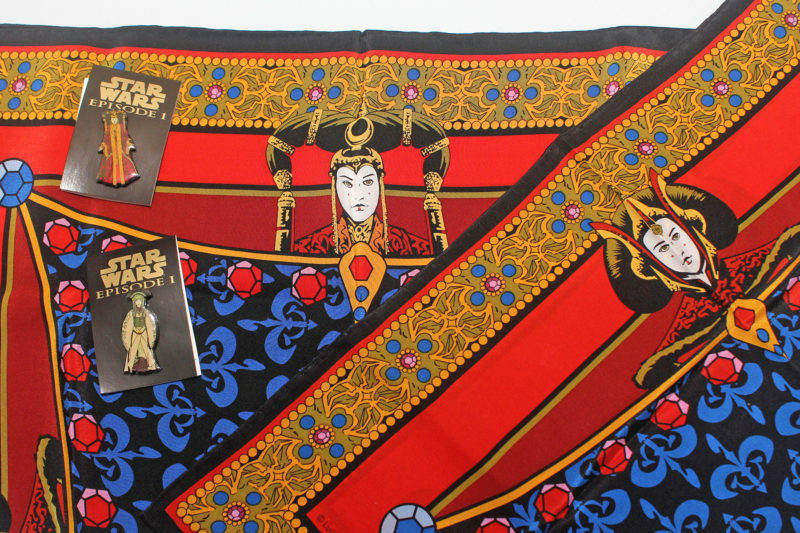 I also have the beautiful Queen Amidala silk scarves made by Ralph Marlin, and two collectible pins featuring Queen Amidala – I received these in a trade with a fellow collector in Japan. While I’m not sure when the Jedi Order logo was first used, it has a strong prequel connection – it certainly doesn’t appear in the original trilogy. Perhaps one of the most notable appearances is on Obi-Wan Kenobi’s shoulder armour in the Clone Wars series. While it is now often used in association with all Jedi, for me it still has a strong prequel connection. 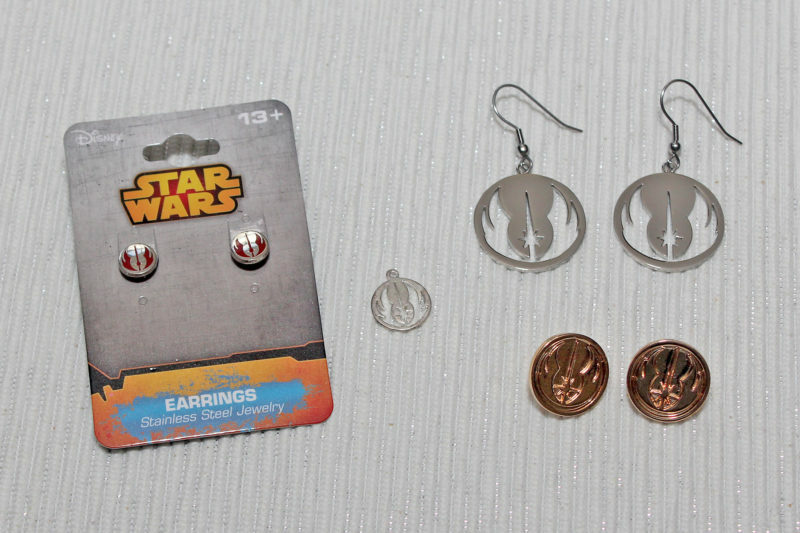 Being both a Jedi and prequel fan, I often pick up jewelry items featuring the Jedi Order symbol when I can – like these earrings by Body Vibe and Bioworld, and the charm by Her Universe. 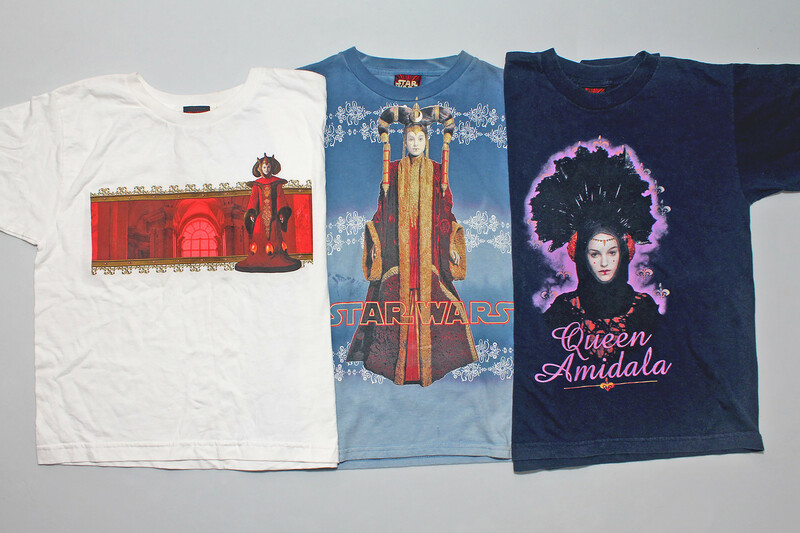 Lastly, in my quest to have more Queen Amidala themed apparel, I have taken to tracking down men’s/boy’s t-shirts from the Episode 1 era. While I don’t wear these in their current state, I plan to customize these into more flattering women’s style tops. I just wish that I didn’t have to, it is so frustrating that Queen Amidala is not featured on women’s apparel very often – something I wrote about in an earlier article. While I know companies want to create apparel and accessories featuring characters from the new films, I do hope we see more prequel themed items in the future – we should be able to show our love for our favourite characters, from all the films!